A prominent member of the New Hope School, Kenneth R. Nunamaker was born in Akron, Ohio in 1890. He traveled west at the age of seventeen, herding cattle for a living. This marked the beginning of Nunamaker's artistic "training". He painted in his spare time, translating the landscape around him into shapes on his canvas. Nunamaker received his official training in the art department of the Akron Engraving Company in Ohio. He moved to the Philadelphia area in 1918 and became the art director of Hoedt Studios. He moved to Center Bridge, Pennsylvania in 1923 where he developed a close association with members of the New Hope School. 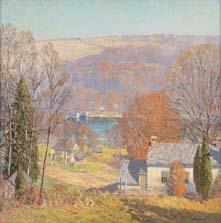 Nunamaker was strongly influenced by the impressionist paintings of Edward W. Redfield, who subsequently took the young artist "under his wing". With Redfield as an unofficial instructor, Nunamaker became acquainted with the other artists living and working in and around the New Hope Colony. He left Hoedt Studios in 1945 and opened his own studio in the Beury Building in Philadelphia with his son Alfred. Here the artists created free-lance commercial art. He exhibited extensively with one-man and group shows, including the Pennsylvania Academy of Fine Arts, the Philadelphia Sketch Club, the Woodmere Gallery, the Peabody Institute, the Phillips Mill Art Association yearly exhibit of the New Hope painters, in addition to exhibitions at the Corcoran Gallery in Washington D.C., the International Gallery in Venice, and the National Academy of Design and the Salmagundi Club in New York. The paintings of Kenneth Nunamaker were not shown to the public after his death until Newman Galleries acquired the pieces in 1985 from the artist's son Alfred, for a retrospective exhibition. The artist died in 1957.